Y wrote wondering what had happened to me in and since Gaza. I apologized for not streaming news constantly but wrote that I thought I’d implied my safe condition and new location thru the few messages I did send. Her concern gratifies me. She is preparing for homecoming as I am, determined to move to the opposite coast by December, whether or not she’s bought housing. That’s her persistence. DN showed me the synagogue and yeshiva that exists in an area Irving Moskowitz, a rich Jewish business man from the United States who desires to Judicize all of Jaffa-Tel Aviv, hopes to purchase so he can develop housing for Jews only. We concluded the trip with a visit to the Shimon Peres Peace Center, if I have the name correct. Unfinished, using much glass, near the coast, on top of cleared Arab land, the project ran out of money. And now the building sits idle and empty, its glass a ready target for Arab youth. Nearby is an apartment complex lived in by Palestinians. To not embarrass the Center, the city renovated one side only of the complex, the side facing the Center. This became the subject of jokes. Eventually the city renovated all the sides. While photographing, Ibrahem phoned to return my call that I’d made to say goodbye, voice to voice. He asked me where I was. You’d never believe—Jaffa. Oh Jaffa! he exclaimed in appreciation. As if to say, that is one of my favorite spots in Israel-Palestine. I hesitated to express too much enthusiasm about my locale, to not make him overly jealous. But there we were, not more than 70 km apart, in better times an easy 45 minute drive—and those better times were not so long ago. Eric told me just 21 or so years ago, before the First Intifada began when the wall was not there, Israeli Jews would visit Gaza to shop, swim, see friends, and Palestinians would come to Israel to work. Could happen again. But for now, Ibrahem is trapped in Gaza; most of us cannot enter easily, especially Israelis. Nearly back to the hostel, almost depleted of energy gas, I heard music, a cross between klezmer and jazz. Why not check this out? Dancing in the streets, a Lindy Hop troupe of scantily dressed women, kids dancing, everyone smiling, what joy! Can this ever happen in Gaza? Even in Ramallah? Not with the current political and cultural controls. What a pity. Another major difference between life in Gaza and life just a few kilometers north. Where in the territories my usual wake up call was from the muezzin, around 4 AM, here in this more “civilized” part of the world, at least in Tel Aviv, at that same time I hear the roar of aircraft landing at Ben Gurion. Each plane probably includes at least one tremulous traveler, worried about getting thru security and into the country. I am imagining myself as that person on each incoming flight. The day was mostly exploring the coast, starting at the viewing platform near the hostel, first south toward Gaza, the old port, retracing my route to head north into Tel Aviv proper. Many fishing boats in the old port, a tour boat or two, one seafood restaurant, lots of walkers, bathers, bikers, tanners (I was amazed at the high number of beach goers who lie or sit or walk in open to the sky regions, no tents and few umbrellas, much different from Gaza), and someone had accidentally or purposefully left a box of nut treats on a ledge. I helped myself. The day was again hot, bright sun, fatiguing but rewarding walking. And my legs did not hurt me for a change. Perhaps something to do with lightening my load. The beach north repeated the beach south, with large numbers of families with small children romping in the sand and water. Finally, after some 5 weeks in coastal territory I entered the water. It was grand. Salty, refreshing, warm, full of high waves that I played in—along with 100s of others, mostly frolicking Israelis. Occupation? What occupation? Gaza? Where is Gaza? Most Israelis, including David Nir and the Wesley’s report that most Israelis have stripped out any awareness of Palestinians and the occupation. Just 50 km south of here, dear friend. You’ve heard of it? Gaza. Any idea how people live there? What their beach is like? Their food supply? Their employment? Their security? Their love lives? One surprise on the walk north yesterday—a playground with a few younger and elder youth along with adults playing on the equipment. As always when I observe such scenes I think of my grand kids, me playing with them. The equipment was novel and included swings that many could sit on simultaneously, another swing more like a long log that several could ride on, and various sorts of merry go rounds. I hesitated to photograph here, not knowing what to expect from kids and their parents. I anticipated they’d not be eager for photography, might even object. No one objected, no one seemed eager. A nonchalance that is perhaps characteristically Israeli? As usual on this trip, summer time, the light was harsh, not the Mediterranean light that I often work with, think about, talk about. Clouds formed in the morning, dissipated by late morning. A few power skis, one of two sail boats way out, a unique lifeguard technique of using something like a large surfboard the attendant perched on, propelling himself with a long double bladed oar. His only duty seemed to be shepherding people back to the guarded swimming zone. The life guard station, high and of wood, resembled that of Gaza, but with better construction and loudspeakers rather than bullhorns. No Israeli navy gunboats patrolled along the horizon. Women wore bikinis, and the young ones exhibited tremendously healthy and seductive bodies. The men tended to wear long shorts, like mine, and only a rare one wore the tight form of body revealing short shorts. This pleased me since I fit right in with my baggy shorts. No tops for the men of course, unlike Gaza, and if there were Muslims swimming in this potpourri, no women wore the traditional long gowns. I’ve asked about water quality and usually hear either I don’t know or it’s good. So I felt safe wading. People played paddleball, mostly young virile strong men, also a few women. The sound of these bouncing balls permeated and defined the aural atmosphere of the beach, along with joyful cries of kids. I note that I’ve not written about big sections of my experience, entire lacuna of important experiences is missing, notably: Nomika, Husam, David Nir. How to retrieve this, when? Yes, Beny Gefen, who I met in about 2004 while helping Palestinian farmers harvest their olives. We’ve stayed in touch these 5 years, and he responded with an invitation to visit when I sent out the word that I could visit people along the coast. I’d been curious about him for many reasons—his Palmach background, work with Palestinians, but especially his Chinese girl friend whom he frequently mentioned. He is retired from a life of farming. Born near where he lives now, east of Natanya, moving to the Galilee for some years, farming there, married 10 years, several children including a son who died while in the army in or near Lebanon, a string of younger girl friends who he’d frequently travel with, and he now lives in a retirement community named Protea because of all the South Africans who live here. We met one while waiting for the pool to open this morning. A genial fellow with a strong South African accent, he explained that he moved prior to the end of apartheid exactly because of apartheid (he pronounced it apart-hate, as I’ve heard most South African’s pronounce it, opposed to how non South African’s usually say the word, apart-hide). I identify more with Israel than I ever did with South Africa, he confessed. Beny is a delight: 83 years old, looking a decade younger, a very youthful spirit, active in resistance to his country’s apartheid, a total secularist interested in evolution, lover of plants (his house is adorned with them, his porch especially, as are most porches in this community; one plant, with white flowers and a yellow interior, 5 petals, he places in honor of his brother who also has died in some tragic manner), small, clean, neat, well organized apartment (2 bedrooms, a combined living-dining-cooking area, the porch, a toilet with shower, expensive to live here, he told me), he has photos and drawings on every possible wall space, along with books pinned open to photos, usually nature scenes. Featured prominently: Ming Mea, his 34-year-old Chinese girl friend. Beny seems to be a student in philology. We discussed what he believes is the origin of the written language, occurring in this region about 3500 years ago, a mixture of Phoenician and Canaanite, with influences from the hieroglyphics of Egypt. All leading to Aramaic, the lingua franca of the region then, and eventually to the Semitic languages of Arabic and Hebrew, later to all the other written languages. Quite profound, if true. In pictures he showed me how Hebrew letters evolved, 22 of them, all from signs which earlier indicated concepts. Demonstrating on his full first name, Binyamin, he broke it down into about 4 syllables, each syllable representing the first letter of a word that the letter looked like. He also proved to me the closeness of Hebrew and Arabic by sounding the words for the numbers—some are identical, like arba for four, and most others sound similar. Perhaps one reason I like him so much, other than his politics and background, is how much he resembles my favorite grand pa, Ed Sage. I remember grandfather when he was older, and I think he looked much like Beny looks now. I should compare portraits and tell Elaine [my sister] about this. It’s not only the physical resemblance, but something about essence, deeper spirit, their humanity. In other details like work, politics, etc, they are not similar. His Palmach experience is equally fascinating. He joined in 1944, and saw combat against the Brits. The organization was initially formed, he explained, to resist the Germans under Rommel who at one time during the war were thought to be able to invade Israel. When invited, Beny later joined the paratroopers, among the most elite of the fighters. He served in the reserves until the age of 57. On his front door he showed me a photo of an invitation for a reunion of one of his units—it shows the young Beny with colleagues he standing, the others sitting, looking into the distance..
During one of these tours he observed Israeli soldiers murdering Egyptian prisoners. He objected and was able to stop the killing. Another incident like this occurred later. I presume these experiences were part of what turned him from fighter to activist for Palestinian rights. He’d been enthusiastically describing two friends of his, Buma, a younger man, and a woman. Buma joined us, carrying a notebook that contained letters and photos of his work. He has many contacts in higher echelons of Israeli bureaucracy so is able to procure permits for ailing Gazans to reach Israeli hospitals. He also brings West Bank children into Israel, using this same access. And he is always on call to help any Palestinian requesting help. I am one person, he proudly declared, not an organization, yet people find me, those that need me, and those that wish to help my projects offer funding. He showed me a letter from an official in Mattel toys, potentially offering to send toys. Driving here was easy—the roads are well maintained, the signage clear (often in Hebrew, Arabic, and English), traffic controls effective. I didn’t see any police vehicles. Which reminded me that such vehicles are unmarked, so I use caution and obey the rules. I’m trying to be extra vigilant in my driving practice since I have a $450 deductible insurance agreement. The car is small, a Hyundai, auto shift, air conditioned, and might be my bedroom if needed. Cost is about $380 for 10 days, assuming no mishaps. Plus gas and tolls. This rental and the driving reminds me of 2 similar experiences in South Africa: the first with Tom Sander in 1990 when we rented a car to drive from Jo’burg to Cape Town, and then 9 years later with Y on a blissful trip down the Indian Ocean coast, stopping at several resorts for overnights. I recall especially worrying about crime, and thinking the so-called “flying squadron” was a joke. By being named “flying squadron” this service might lead me to believe, an emergency? No problem. Call the flying squadron and they’ll be here instantaneously to assist. We chose not to rent a mobile phone so how would we call them—if they even existed. I explored Caesarea (pronounced, if I recall correctly, ceez-ar-eea, with 2 long e’s). Once a prime coastal city because of its port, its beauty, grandeur, influence, and population waned and waxed for over 2500 years. Originally a small town, possibly Phoenician, known as Strato’s Tower, successively it was Roman, Byzantine, Arab, Crusader, Ottoman, British, and now Jewish Israeli, reflecting the history of the region generally. Viewing the reconstructions thru drawings and films I was reminded of the White City of turn of the century Chicago, the World’s Fair that prompted massive building, most of which vanished not long after the Fair closed in 1893. Same with the port, the city, most of the features of the most impressive period of Caesarea—lost to wanton destruction as in the case of some Arab groups and the Crusaders, and the “sands of time,” literally, the sand, water, winds and perhaps stones blown ashore by storms. One very interesting section of the site showed stratigraphy, how many different layers had been deposited onto the original constructions, after the constructions. I walked the length of the hippodrome (in Latin, circus, not what we think of as circus with clowns, trained animals, trapeze acts, etc, but spectacles for the masses, such as gladiatorial contests, torture of despised groups like Jews and early Christians, etc), imagining the chariot races, the slaughter of captured people, and other entertainments for the population then. I ate lunch (chicken snitzel and fried potatoes with greens, for 55 NIS) overlooking the old port. It is now not only a tourist attraction, but a major swimming and relaxing place with maybe 100 people including small children under beach umbrellas, enjoying the view, the history, the water, the wine. How vastly different from Gaza beaches. Eating at this restaurant, with Israelis serving me, eating with me, cooking for me, and profiting from me, I had to wonder: what am I doing spending my money in Israel, adding to the country’s survival, in effect, validating its existence? This is a problem, it was a problem for me when I first visited apartheid South Africa in 1990, during the boycott. Some thought, Skip, with your views about the apartheid regime, why are you going there now? You’re validating and supporting the government’s existence. Feebly I responded with, I’m a witness, going to observe and report. Is that a sufficient rationale? Crusader walls; a mosque built in the last century for Bosnian immigrants, itself over church ruins, over earlier mosque ruins, perhaps over a Roman shrine; the remains of sunken gardens and palaces; an array of ruins that were once buildings on the inner harbor (here I made a panoramic photograph, click to view it); the Roman theater, heavily damaged by time and deliberate destruction, and then reassembled into a huge fancy venue; and, best of all, the Time Trek audio visual display. This consisted of what they termed “holograms,” actors voicing answers to questions the viewer might ask, playing characters like rabbis, queen and empress Helena, the mother of Constantine, and I assume Roman soldiers and leaders, plus a movie that for me was the single most important interpretative device. Using animation, it simulated the various time periods, making them more vivid. Much to photograph, and even more to think about. The power of place. The passage of time. Immortality. Visions of grandeur. Decay due to natural forces, decay due to human forces. All for the price of 18 NIS (I qualified for a “pensioner” discount, even tho it’s meant only for Israeli elders), much walking, the sun, and some confusion. Few others were with me and when I inquired about this to a young man staffing the movie, he said, During the week it’s pretty quiet, our busiest times are the weekends. I was surprised, I thought such a magnificent site with such excellent interpretation would draw 1000s daily. Maybe later. As I’ve noticed and written many times, the Israelis are good at archeology and museum building, despite their propensity—which is not unique to them— to remake their own history thru their discoveries and analyses. Not to overlook the Roman aqueduct, fitting precisely into one of my main themes, water, hydropolitics. In my guidebook I read about the aqueduct which brought water some 17 km to the city from mountain springs. Parts of it are well preserved, others seem to have disappeared either beneath the sand or washed away by the sea. This was truly a delight to photograph. Not far from there, on the highway, I fleetingly noticed another aqueduct, not as prominent, maybe a section of the same one, and next to it—modern pipes, maybe carrying water. That would have made a great photo but I didn’t see it in time, couldn’t stop, couldn’t easily turn around. Lost the prize-winning fish, the big one got away. Napping yesterday afternoon in Nazareth, the thought occurred to me: I’m in a mixed Muslim Christian Jewish town (of about 6,000, 2/3’s the size of my town), my t shirt has Hebrew lettering (perfect for Caesarea) and I’m wearing the type of shorts that would be verboten in the West Bank and Gaza, will I get into trouble walking around Nazareth? I asked the sister at the desk, she thought, not a problem, people wear all types of clothes here. And so it was, altho I still felt noticed, not as much as in Gaza or some parts of the West Bank, Jenin notably. But I’m slowly looking more ordinary, more a tourist. After the walk I noticed that the outdoor only mosque in front of and down from the Basilica was thronged with mostly men, standing, sitting, bowing, prostrating. I remembered that when I was last here local Muslims were attempting to build a regular mosque at this site, conspicuously close and in front of the Annunciation Church or Basilica, one of the holiest places in Christendom. Is this battle? A local woman confirmed for me that indeed there had been some controversy over this placement but now it is settled. She thought they prayed only on Friday’s and was surprised when I told her they were praying big time last night. The battle for god continues. I’m near Capernaum, my main target for yesterday, a place I’ve longed to explore since it might have been part of my first awakenment as a Christian, a Christ lover and follower. This is lodged in me deeply and it may have emerged when I visited Capernaum yesterday—along with hundreds of other tourists and pilgrims. One dream of possible significance, about Andy Towl whom is vital in my life yet whom I rarely dream about. I had forgotten to mention him when I listed my friends who liked using cameras. Despite this slight he gave me one of his old cameras, it looked like a super 8 movie camera. He was explaining its idiosyncrasies. I felt very warm toward him. Is he a sort of Christ figure to me? The main sites of exploration yesterday—long hot day, I surmise that as we lose elevation the climate warms, becoming closer to the Jericho climate with its intense summer heat and humidity—Tiberias, Cana, museum of the ancient boat, Capernaum, Mt of Beatitudes, and this guest house/youth hostel. Cana was a drive thru, saw little, mostly a rough village, missed the churches listed that mark the site of an early Jesus miracle, water into wine (a miracle I’d love to be able to do, substituting beer for wine). My muses kicked in for a perfect short walk along the shore road south of Tiberias. There I discovered Roman ruins, mostly a commercial district with market and shops. Men were restoring some of the main walls. They directed me in and higher to see other remains. The shore front is now mostly privatized, which I’ve heard is causing some controversy. Spotted along the way were public areas. I saw very few people swimming here, but it is midweek. A main hit seemed to be the water park, filled with rides, umbrellas, frolicking families. This reminded me of Aqua Land in Gaza, on a much grander scale. 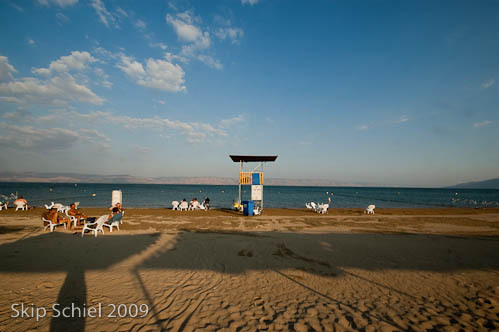 The Romans founded Tiberias, allegedly because of the hot springs. I didn’t find the springs that are in use, but did find an old hamam that is part of an Israeli national park. Inside the remains of the hamam or bath, reminding me strongly of the hot springs at Tenakee Springs in Alaska that I visited with Elaine and Bob last fall. Capernaum was larger than I’d expected, consisting mainly of a recently built Christian (Franciscan? Always a good guess here because they seem to control so many of the Christian holy sites, Francis might be repulsed by the aggressive acquisitiveness of his descendants.) church over the site of another church or series of churches dated to about the 4th century; the “white synagogue” built a few centuries earlier and said to be built upon the synagogue Christ as a boy taught at; and a complex of ruins which were once the town. The community had been extensive at some period, and then they disappeared, the site never again inhabited (except by the keepers of the holy sites). Inside the church, pilgrim-tourists like me prayed, stood in silence, photographed, and generally, with great reverence, contemplated where they were, and what had reportedly occurred here. I am continually mystified at the power of place, how it energizes our imaginations to penetrate the veil of history. Or at least give us that feeling of penetration. The builders used a curious black stone, probably basalt, which indicates volcanism in this region’s past. I notice the terrain change from coastal sand, to rock, mainly limestone I’m guessing, or sandstone, very hilly as I entered the Nazareth region. More hills, more stone, and then the sand once again at the lake’s periphery. Driving north to this region, I noticed a water carrier on the right or east side of the highway. Stopping, I photographed but I doubt it will look like much more than a long concrete square shaped thing. I included pipes at one point to better signify this object’s use. But I’m not sure what it carries, perhaps water from the Galilee Sea? More vegetation as well, but I’m not keeping track of the exact changes. Had Y been with me on this part of the journey she’d know. At a different site, a museum which featured a partially reconstructed fishing boat from the era of Jesus (talk about resurrection!, from the depths of history and decay), the museum dedicated to one of the founders of the Palmach. Many tourists here, which I photographed as they rummaged thru the gift shop. I rummaged myself later and picked up an historical atlas of the region. (I was tempted to buy another book, about exploring the temple mount, but cost and bulk dissuaded me.) The museum had several art exhibits about kibbutzim, photos of people in silly poses and artwork made with cotton patches, none of which struck me as profound or even interesting. I missed the main exhibits because of the cost—“man” in the Galilee, and something about the history of kibbutzim. Then the Mount of Beatitudes, where Jesus made his grand debut with his sermon on the mount. It’s slightly north of Capernaum, a gently rising hill or mountain from the Capernaum side, sharper incline west of the mountain, the road curving and steeply inclined. Because of the small notations on my maps and the sometimes-ambiguous directions in my guidebook, I had to drive along the Capernaum road several times before discovering the main road up the mountain and the cutoff to the Mount of Beatitudes. Worth the anguish. Another church, another vista, another opportunity to imagine more of the life of Jesus. And to ask questions: where on the mountain exactly was he, how many were in the audience, how could they hear him, precisely what did he say, is the rendition we know even close to his message? All probably eternally unknown—unless someone journaled reliably (not someone like me who fabricates and has a rotten memory) and that journal is discovered hidden somewhere in something like an urn, like the Dead Sea scrolls—another resurrection. A group from either Italy or Romania that I’d noticed at the museum was at the mountain also, shepherded off down a path away from the church for a special service. And then my final destination, the Karei Deshe-Yoram guesthouse. I’d read about it in the guidebook, cheap, lovely, accessible, but where is it? The map and directions were not much help, and even less help was the woman I repeatedly spoke with at the guesthouse who seemed to confuse north and south, junction names, etc. Or more likely this is just my poor hearing. Frustration set in to the point of framing an alternative plan, driving further north, looking for a camping spot I read about. However, this was not needed, I found it, [clearly marked I later discovered], off the main road. Who’d know? During the pit of this experience I berated my muses and Christ: where the heck are you now that I need you? What sketchy friends! And then they came thru. Was this because I’d turned critical and demanding? This place is grand, palatial, in the Mediterranean style. Said to be on the site of an older khan or guest house from the Mameluke period, the 12th century, it is huge, encloses a courtyard which itself is filled with palms and other trees and shrubs as well as a multitude of birds. It sits near the shore, which now, because of depletion of the lake, has receded to about 1 km from the hostel. I’ve noticed in all my views of the lake that the shore area is expanding. I’ve tried to show this. What once might be called a sea, now is more properly a lake, and could, unless remediation is applied quickly, turn into a pond and then a marsh, and then be dry. Is this part of the fate of the earth? One clear sign of shore recession is the beach facilities like lifeguard stations. Here the earlier one, well built, handsome, with a pole like those in fire stations for quick descent and rescue is far from the shoreline. A new structure is in place, rudimentary compared with the old one. This morning, as the sun rose (around 5:30) I climbed the steps of the old station to gain a better position for the photos. Also grassy areas, newly seeded, and different types of sand and gravel mark the changes. All this occurred recently I believe. At the guesthouse (for about 110 NIS, breakfast included, an extra 50 for dinner, coffee and tea and a fridge in the room) I ate with about 20 others, mostly 2 groups of young people, both sounding German. One group sang their grace in perfect harmony, filling the dining hall with lilting music. A backpacker sat by himself, another man sat, like me, alone. One family is here with small children, and a group of 4, 2 couples from France also share the facility. This meal came at a perfect moment for me: I’d inadvertently fasted most of the day since breakfast. One green apple and one peanut brittle constituted my late lunch. Then the evening feast. This going without food is part of this form of travel: when will I be able to buy a sandwich or groceries or a beer? I saw few opportunities for either along this route. Rooms, numbering some 100, are dorms like mine (4 beds, I slept alone), singles and doubles, on 2 levels, most looking out or into the courtyard. Everything is air conditioned. Wifi is extra (about $5 per hour. Swimming was glorious. This marks my 3rd entrance into the water, the first was the Mediterranean in Tel Aviv, the 2nd the pool at Protea Village with Beny. In both cases I didn’t worry about water purity. Warm water, very salty in the first case, fresh in the 2nd and 3rd , and auspicious in all cases, especially the 3rd. At the guesthouse beach a sign declared, swimming absolutely forbidden! What?! The counter person had told me swimming is possible. So I checked with someone beachside who replied, of course, swim. Is this another Israeli trait—to declare and not mean seriously? This morning, up at my usual time, about 5:30 (no matter what time of year, when I’ve gone to bed, how well I’ve slept, I’m up). This time to stroll down to the beach at that magical hour before sunrise. No definitive sunrise this morning, but a slowly brightening glow from across the water. I photographed this from various angles as time passed, the light changing. I didn’t photograph the twinkling lights to the west, running up hill, many homes, maybe Tiberias? I’ve managed to photograph, write in my journal, download images into the computer, back them up, and quickly survey them, but I’ve done little blogging or web maintenance. This might have to wait for Ramallah, or later, Cambridge. Unless I take a day off from driving and stay somewhere 2 nights. I feel this leg of the 3 month journey of discovery is something I’ve long yearned to do: the coast, Galilee and hopefully the Golan and then the river valley. As if primordial in my being, going back to childhood. Key words kick me off: Galilee, Capernaum, Tiberias, Mediterranean, River Jordan, Golan Heights, etc. These words are markers in my experience, in forming my perspectives, my maturation, and now, as if discovering the root of recurring dreams, I’m there-here. When I write others, like Suzanne and earlier the Boston Lighters, I try not to boast, but to admit that what I’m doing is a special grace not available to all. As lonely as I can be on journeys like this, I’ve come to realize I never travel alone. Always with me: muses, memories, dreams, desires, and the tools I have to share my experiences. Would I be as motivated to share if I were traveling with a real person? If Y were with me or X or ME or one of my daughters and her family. The incentive to broadcast—in effect to create travel companions—might vanish. This sort of travel is a joy, so far, very relaxed and happy, compared with my previous travels on this particular trip. Those usually involved complicated transport, as in the West Bank, often harrying, as were the shared taxi rides between Ramallah and Bethlehem, or the travel to various areas of Gaza usually with friends as we observed the unreconstructed carnage. Adding to the intrigue of this journey is planning for my next southern tour in the US. Dave asked me to decide when I’d arrive in Raleigh, and by what transport. So I reserved a seat on the train from Boston for Saturday, October 17, arriving the next day, first show on the day following, all this in less than 2 months. Mind bending. This ending is especially beautiful and evocative, Skip. Your listing of the names that are part of so many of our lives. And your thoughts of why you are writing, in part,–because you are “alone” and conceiving of, creating the sense of companionship by writing. Later of course, you, as your own good companion, will experience the trip over and over as you revisit beny and the sea and the now harsher light. And at this moment, we fortunate companions via word and stunning photos have ourselves the sense of being there with you — through your words and your eyes. you are the best, you (along with several other important factors) make my life worth living. thanks for your deep thoughts and feelings. i’m in beit she’an tonight, in a gorgeous hostel that is part of a movement in israel, something i never anticipated. clean, relatively cheap, airy, friendly, shaped like an ancient khan or inn, with stunning views of the jordan river valley, i couldn’t ask for much more. one way or the other bruce we make photos. you there, me here. maybe next time, you here, me there. all is impermanent. i miss the lighters, follow as best i can your exploits, often wish i were there. i’m exploring the jordan river valley today, heading south toward jericho, from last night’s stay at a guest house in the old roman town of beit shean. You’re doing some amazing work. I especially love the photo of the women dancing. How incredible to find such unexpected joy–and your photo does that joy justice. The light and scenery does seem magical. We had a nice shoot on the Common and Public Garden today, but seeing Roman Aqueduct near the ocean is amazing.